For our season-opening meeting, all players will be together under the musical direction of Vicki Boeckman. Opening programs will start at the October meeting. Miyo Aoki will be leading the Backroom gang starting with the October meeting. This website carries information about forthcoming meetings including the opening program and the music for the playing session. In addition, there is a review of the preceding meeting as well as other information of interest to recorder players. Dues for the forthcoming season will be $40. Members receive e-mail reminders approximately a week prior to each meeting. There are no special musical requirements for joining the SRS. The level of skill necessary to play the music varies from meeting to meeting, and participants are free to play as much or as little as they care to. Beginning classes are now available through the SRS. (Details are on this website.) For those wishing private instruction in recorder playing, an additional list of available teachers is provided on this website by clicking here. 18th, and our annual Holborne Play date on August 19th. What a thrilling mu-sic making weekend it was! Please see below for the write-ups and pictures. And don’t forget to check the SRS Facebook page every so often and “like us” if you are so inclined. For our playing session on September 7th I would like to gather everyone in the big room to start off the season together, so there will not be a Back Room Gang. The music will be accessible to all. If there are some notes or parts that are a bit tricky, just keep breathing and follow along until you can get back in. I am sure that whoever is sitting next to you will be patient, supportive and helpful. I have chosen music by Dietrich Buxtehude, J.S. Bach, Georg Philipp Telemann and John Dowland. Seemingly disparate but in fact closely linked brethren spirits. Laura Faber’s inspiring choice to play Buxtehude’s Missa Brevis for the “warm-up” piece at our Holborne Party jogged my foggy memory that both Dietrich and his father Johannes Buxtehude were revered organists of their time. They both held posts in the two main churches in the little town of Helsingør (Elsinore) in Den-mark - Mariækirken and Sankt Olav’s Kirke (as a side comment I will share that I’ve had the extreme pleasure of not only performing in both of those amazing old stone churches, but of making recordings in them as well). After his eight year post in Denmark Buxtehude spent the remainder of his life as organist and music direc-tor for the Marienkirchen in Lübeck where he had a huge influence on the music community and was a model and mentor of later Baroque composers such as Han-del, Mattheson, Telemann and J. S. Bach. In 1705 when Bach was a mere boy in his 20s he traveled over 400 kilometers on foot from Arnstadt to Lübeck to meet and hear Buxtehude and subsequently spent 3 months there to learn and listen from the master. My plan for the September 7th meeting is to play music by Buxtehude and the composers who were most influenced by him. We’ll start with the Kyrie and Gloria from the Missa Brevis, enabling members who were not at the Holborne play date to have the opportunity to experience it. Then some short fugues by Telemann and Bach, and the gorgeous Sonatina from Bach’s Cantata #106, and end the even-ing on a sprightly galliarde by John Dowland – The Most High and Mighty King of Denmark, His Galliarde is the full title. All sizes of recorders from soprano to con-tra bass will be needed, and we will definitely need C basses and contras for the Bach #106. If anyone wants to try playing a contra please let me know. It is a gen-tle giant and needs a bit of time to negotiate a comfortable playing position, but once found it is a piece of cake. We will need you for that piece! I am delighted to welcome you to the 2018-19 season of the Seattle Recorder Society. 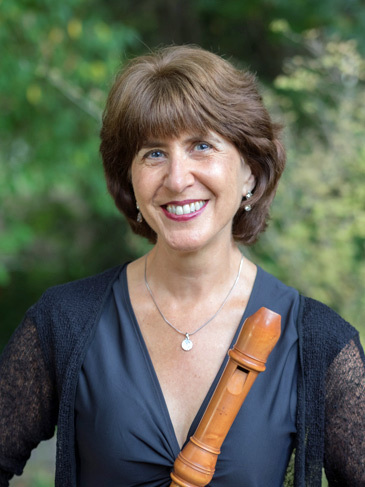 As your new president, I look forward to leading the business portion of the membership meetings, meeting with board members throughout the year, playing lots of great recorder music and socializing with friends and recorder enthusiasts. If you are a newbie to SRS or seeking a supportive atmosphere de-signed for budding players, be sure to check out our “Back Room Gang” at most of our meetings, led by one of our fabulous teachers — Miyo Aoki or Laura Fa-ber. For the main meeting room, our music director Vicki Boeckman has an exciting season planned, including some great guest conductors for the “big group” play-ers and a variety of enjoyable opening programs. We will announce some meeting “themes” and featured music in newsletters throughout the season: “Romantic Music”, “Audience Choice” and “Contemporary Music (20th & 21st century)” are some examples. The first meeting of the year is a great time to begin or renew your member-ship for the Seattle Recorder Society. For your convenience, you can include your membership to the American Recorder Society (our parent organization) and donations on the same form. Your contribution is always welcome and pro-vides a solid foundation for sustaining our musical endeavors and continuing programs – whatever you can give is greatly appreciated. See you at the membership meeting on September 7! I hope you all had a wonderful summer full of music-making. A heartfelt and warm welcome to our new pres-ident Nancy Gorbman who shares some exciting things with you in her welcome article above.